Pre race Packet Pick-Up will be held at Fleet Feet Sports at 303 E Altamonte Dr, Altamonte Springs on Thursday (May 16) and Friday (May 17) from 11 am to 6pm. Race day Registration and Packet Pick-Up will begin at 6:30am. Adult Registration (18 to 64 years old) is $20 until May 3, 2019 at midnight. $25 until May 17, 2019 at 9am. Adults race day registration is $30. 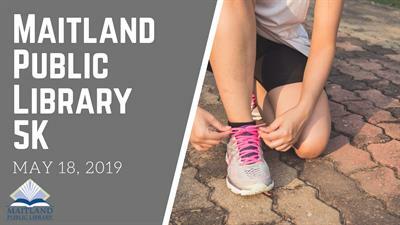 Support your local Maitland Public Library at our "Readers on the Run" 5K Run / Walk at Quinn Strong Park in Maitland. The 5K Run/Walk will be Chip Timed and starts at 7:30 am sharp! The Kids Run for those 10 and Under starts at 8:30 and is FREE! Distance is 100 yards... or meters if you are European! Participants will receive a themed T-shirt AND Medals to all Finishers! Awards will be presented at 9 a.m. to the Overall Male and Female finisher and the top three in each age bracket. For safety reasons, bicycles, wheelchairs, inline skates, skateboards and dogs will not be allowed in the race. Jogging strollers are permitted but because they can easily tip on a sharp turn, stoller participants will start behind the main race and there is a 15 minute per mile pace limit. Stroller / Joggers operators must yield the right of way to runners and may not weave through packs.